They met recently in Washington to decide and dictate Congressâ€™s future policy. In other words they rule America. The members of the AIPAC 6,000, who are themselves Congress members, monitor, identify, and target other Congress members to the core AIPAC 6,000 for lobbying and intimidation. Carter says it is political suicide for any Congress member to disagree with the AIPAC 6,000 or not obey their demands. They are a highly dangerous bunch that determine and control American policy. If Israel decides it wants to attack Iraq then it is done. If Israel decides it wants to attack Iran then it will be done. 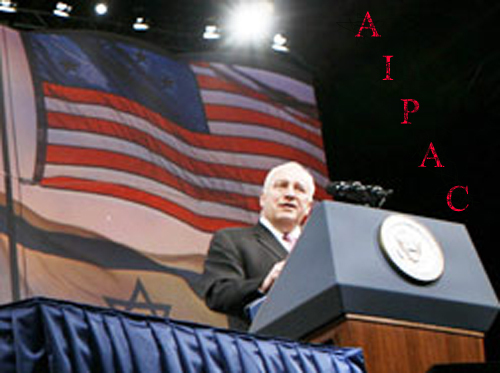 The groundwork has already been done by the AIPAC 6,000. The legislation being put through congress by the Democrats has been shaped and altered by the AIPAC 6,000 to allow war on Iran. The AIPAC 6,000 are agents working for a foreign state. The FBI and Justice Department knows their names. They should be required to register as agents of a foreign state. They managed a shed load of our tax $$$ last week. A foreign state whose policies are against the interests of the US.